Ballyteige is the 739th highest place in Ireland. 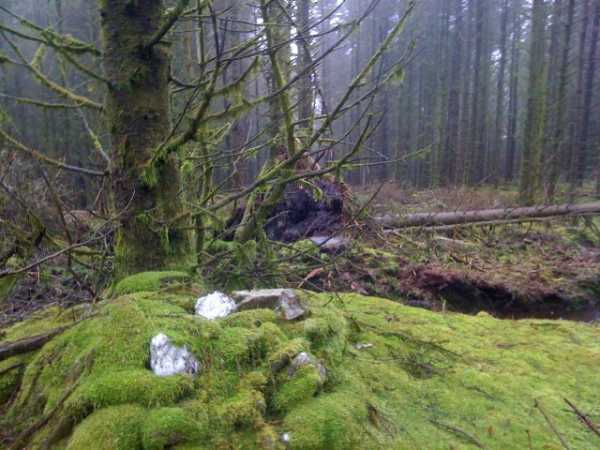 Picture from group : Gentle green mossy summit, as was. Picture: Gentle green mossy summit, as was. Easy summit in forested area. The simplest approach to Ballyteige is to find where the Wicklow Way leaves the minor road at T071 836 A. This is a Coillte entrance and the barrier may be open to park cars out of sight off the road. The tracks are not entirely accurate as shown on the map, but it is possible to reach a point on the map at approximately T064 841 B. From here it is a straightforward ramble up through the forestry to the summit. Beware of some soft ground on the forest floor.